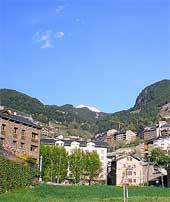 How high are realtors' and lawyers' fees in Andorra? What about other property purchase costs? Tax on sales of real estate (ITP) is levied at a flat rate of 4%. Tax on transfers of real estate is levied at 2.5% on the current market value or selling price of the property; 1.25% is a government tax and 1.25% is a local tax. The buyer pays for the notary fees. The agents will usually expect 5% of the agreed purchase price, and some will ask for 10% if a foreign or associate agent has been instrumental in locating the purchaser. However, it is sometimes possible to agree a lower figure, particularly on the more expensive properties. The commission is invariably paid by the seller, but is equally invariably reflected in the property asking price. There are restrictions on nonresident foreigners buying property. A permission to purchase is required, and a non-resident individual can acquire no more than 1,000 sq. m., or if purchasing an apartment, one unit. When an agreement has been concluded, the buyer and the seller sign and exchange copies of the Promesa de compra-venda (promise to buy and sell), which outlines the conditions of the purchase, such as payment terms and completion date. A 10% deposit payment is customary at this point. The deposit is then put in an escrow account by the agent while a "permission to purchase" (suplicas) request is submitted to the government. Once permission has been obtained, an appointment is sought with a notary. At the Notary's office, both parties sign the Escriptura Publica, the property transfer document. Cheques or bank drafts and keys are then exchanged. Completion, for resale properties, takes about one to two months. How high are estate duties in Philippines?